Safety first is the most important rule in the world of snowboarding, a helmet is probably your best friend on the mountain to keep you safe from an accident. Thanks to modern technology, a snowboard helmet with audio was created and had changed a need to an enjoyment. So, why is it special and what’s the difference compared to a normal helmet? 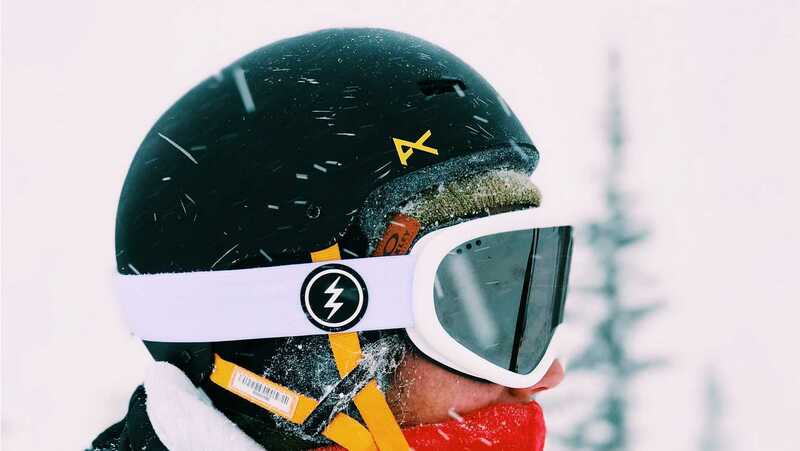 Well, in a nutshell, it’s actually a ski/snowboarding helmet with built-in speakers that can connect to your media players (such as your phone, iPod or any MP3 players) via Bluetooth or an audio cable. In this article, we’re going to show you several of the best snowboarding helmets with audio/speakers. Read on for more. Bern Watts 8Tracks Audio Helmet – great price point snowboarding helmet with built-in audio, suitable for water, bike and snows too. K2 Phase Pro Helmet – a very comfortable and lightweight lib made by the giant of the audio helmet. It comes in many color options too. POC Auric Cut, Park and Pipe Riding Helmet – comes with Beat speakers and remote control cord, and offers great protection to your head too. Do You Need a Snowboard Helmet with Audio? It’s not a must-have accessory, but there are several reasons why you should consider getting one. First of all, a snowboard helmet with audio built-in helps reduce headphone hurt. Sometimes I would go for few rides by myself after finishing the lessons of the day, music is probably my best company in those hours. I had been using different earphones till the day I received my first snowboarding helmet with audio functions. That was one of the best gifts ever!! It’s partly because I have kinda sensitive ears and quite often my ears hurt after wearing headphones for about an hour. Secondly, it minimizes your belongings. With a helmet like this, you can bring only a helmet to the mountain instead of bringing a headphone plus a helmet. Fewer belongings, less trouble, less risk of losing your headphones on the big white mountain. However, if you are not a fan of music or you prefer not to listen to songs during your snowboarding trip then you don’t need such a helmet and a regular one is enough for you. Best Snowboard Helmet with Audio: What to Consider? The connection between your phone or media player to your helmet is very important, generally, it’s divided into two types: wired and Bluetooth. It is hard to say which connection is better because there are always pros and cons. For example, wired connection generally has better audio quality and there is no need to worry about the problem of battery life of your Bluetooth, normally a wired connection would have a longer life than a Bluetooth one. However, a helmet with Bluetooth connection is definitely much more convenient than a wired one. Nowadays there are quite a bit of media players come with only Bluetooth connection, for example, it is very likely you can only pick a Bluetooth connection helmet if you are using iPhone 7 and later models. How convenient it is for you to control the audio output of your helmet would make a huge difference, when you are out there for snowboarding you are surrounded by ice, snow, and water… and I am pretty sure your media player, as an electronic device, doesn’t cope so well with water, moisture, ice, and snow. If you can control your media device with your helmet could greatly reduce the chance of getting your media player wet. Another good example is a helmet with a mic allows you to answer phone calls without taking your phone out. I like those audio helmets that allow me to take off the headphone part when I want to. Honestly, the music output quality for your snowboarding helmet is important but is just not as important as the beat headphones you wear during your day-to-day life. Because at the end of the day, you have so much to do during snowboarding, you need to focus on coordinating your body parts, balancing, feeling the snow, chit-chatting with your friends, enjoying the stunning view… and music is kinda like an add-on for your snowboarding day. And honestly, you don’t want to turn the volume too loud because you want to stay alert to the environment. But then for sure, a helmet with decent sound quality is always preferable. Does your helmet come along with all the factors a good fit helmet needs? Other than the audio part, is your helmet safe and strong enough to offer you the necessary protection? The easiest way is to check if your helmet contains the CE stickers if so, they have met certain EU requirements. Do check the size and shape of the helmet and make sure they fit you with or without the audio output system (if it’s removable). Make sure you are as comfortable as wearing an ordinary helmet. Oh yeah, get one that’s with an adjustable liner. Also, check and make sure your audio helmet is with great ventilation, some people prefer to have even more vents on their audio helmet to make sure their head won’t get overheated. For me, this is not a big problem but you can think about this if you ride a lot by Springtime. A reasonably positioned goggle clips, easy adjusting straps, and good quality buckles are all needed too. As lightweight as possible is a must too!!! Be good to your head and shoulders! A great price point snowboarding helmet with audio. Adjustable fit and with 11 vents. With the wired audio connection, lightweight and waterproof. Love that you can use it for water, snow, and bike. Bike light compatible if needed, and very comfortable and durable. No Bluetooth connection, i.e. if you are using an iPhone 7 or later you’ll need to purchase an adapter like this. A very comfortable, adjustable (guaranteed with K2’S patented fit system) and safe helmet with a wired audio connection. Good ventilation system too! Comparing to other brands, K2 makes much more audio helmets though! Comes with loads of color options. No Bluetooth connection is available. Would be great if more external control could be offered. The best part of this POC helmet is it comes with Beats audio so probably they offer you the best sound quality. And they come with a remote control cord so you can pick up calls, adjusting your music volume and tunes without taking your phone out. With adjustable ventilation system, I especially love the vents at the goggles. This is a lightweight helmet. Great protection, one of our students is a brain specialist, he and his neurologist folks always pick POC helmet, so yeah, I kinda trust them though. Some sellers may not provide the connection cord, so it’s better for you to check with the individual seller and make sure a cord is included in your purchase. Make sure your music is not too loud so you can stay alert to the environment. Safety first! Always try to pair up your phone with the helmet audio if you are getting a Bluetooth one. Dry up your helmet after use. So that’s all I can think of regarding picking the best snowboarding helmet with audio, as I have mentioned in my another article: 4 must-know tips for first time snowboarders, safety first is always the golden rule number 1 in the snowboarding world, so always wear a helmet is kinda like a “must” need. Having a built-in audio helmet is kinda like a bonus, a fancy add-on. Just make sure you are still staying alert to your environment and don’t get hurt because you are enjoying your music too much. If you find this article helpful, please kindly share it out with your snowboarding friends or club members. You may also spend some time reading my other tips and articles on SnowboardHow. Anyway, cheers and have a great day, safe riding!